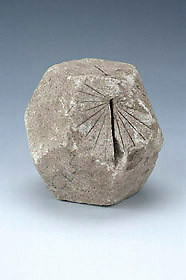 This sandstone polyhedral dial is in the form of a regular dodecahedron. Its faces are weathered and damaged and only three of them have traces of hour lines. Each of these three faces has a slot in which a gnomon would originally have been fixed. There is no indication of the origin or date of this dial.